As business leaders and prospective students increasingly seek proof of graduate readiness and success, it is no wonder that employability has emerged as a key issue for educators. But what exactly does the concept of “employability” entail and how does it relate to international student recruitment? In today’s post, we take a broader look at some current ideas and issues related to employability, and explore how a better understanding of students’ transition to the labour market can be a source of strategic advantage for education marketers. In recent years, employers, policy makers, and other experts have been increasingly calling upon educators to deliver programmes that are relevant to students’ lives (and labour market demands). For some, that means an education that connects with students in authentic ways or that teaches the skills they’ll need to succeed in the workplace, such as critical thinking, communication, and creative problem solving. But there are also concerns that today’s education systems are not sufficiently preparing students to become the “innovative thinkers” and “engaged citizens” needed to meet the evolving demands of the 21st century economy. A recent Gallup study of US college graduates found that those who had worked on a long-term project (at least a semester), had an internship where they could apply skills, and were very engaged in an extracurricular activity were three times as likely to be engaged at work. However, only 6% of respondents “strongly agreed” that these three types of experiences had been part of their higher education studies. Furthermore, the study found that students who had felt their professors cared about them as individuals, had professors that made them want to learn, and had a mentor were three times more likely to thrive as those who did not feel supported. Yet, only 14% of respondents indicated that all three factors were part of their college experience. Two further studies offer some insights on students’ lives after college, and on the employment patterns and outcomes for UK and US graduates in particular. According to the 2012/13 Destinations of Leavers from Higher Education (DLHE) survey, 57.7% of UK “leavers” were engaged in full-time work approximately six months after completing their higher education. At that same point, 12.2% of grads were enrolled in further study and 6.2% were unemployed, as illustrated in the chart below. 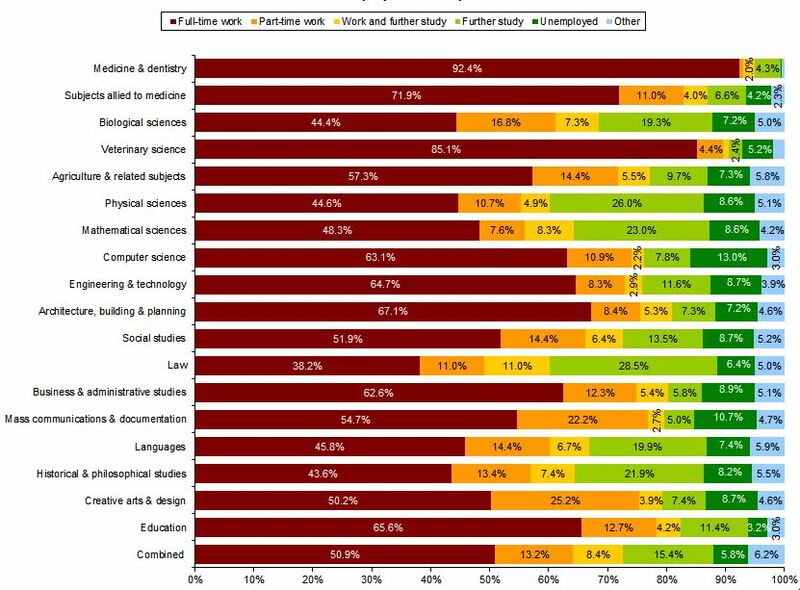 Comparatively, those who studied computer science had the highest unemployment rate at 13%, followed by mass communications and documentation (10.7%), and business and administrative studies (8.9%). More details by subject area are in the graph below. But although some graduates are making the transfer to the workforce, unemployment continues to be an issue for many worldwide, and for youth in particular. 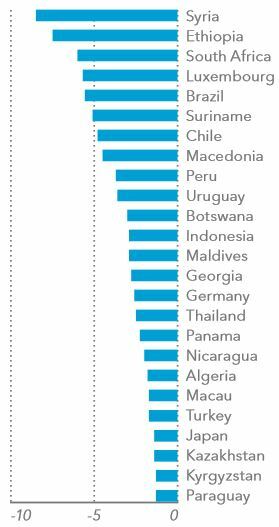 As Euromonitor also notes, however, youth unemployment is falling in some emerging markets, such as South Africa and Chile. We’ll close by turning our attention to some of the other insights from the European Commission report, and explore how educators can define, measure, and monitor outcomes with respect to employability. demonstrate that they have student services that can provide support for the labour market transition of graduates. The report notes as well that employers participate in external quality assurance processes in around half of the education systems studied. This suggests there is a need to both extend the data gathering efforts in many systems but also to widen the participation agenda to address retention issues, as well as employability policies and practice. For more articles on employability and labour gaps within the context of individual markets, such as Nigeria, Brazil, France, Vietnam, and other countries, please review our archives of related ICEF Monitor posts. This entry was posted in Africa, Asia, Australia/Oceania, Europe, Higher Education, Middle East, Most Popular, North America, Regions, Research, South & Central America, Youth Trends and tagged universities with international students, Most Popular, study abroad, international students, apprenticeships.